This is a fun and fairly easy hike that allows the hiker to experience a lush mixed-conifer forest in the upper reaches of the Santa Catalinas, and still lets one get a little bit of exercise. Upon reaching the start of the trail (which is the same as another trail that runs along the upper portion of Sabino Creek to Summerhaven), one is immediately struck by how large the trees are. As the hike begins, it basically follows the contours of the northeast side of Mount Lemmon underneath towering Douglas firs, quaking aspens, ponderosa pines, and the occasional Englemann blue spruce. The trail is extremely easy to follow, and gradually gains elevation for the first mile. Almost the entire trail is shaded, and it is one of the moister areas in the Santa Catalinas. There are probably half-a-dozen springs that occur right off of the trail. Numerous mushroom and fungus species can be seen if there has been rain anytime recently. Many of the trees were burned in the 2003 Aspen Fire, but relatively few were completely torched. There are a few switchbacks in the last - of a mile, but nothing as tough as Finger Rock Canyon, for example. About - of a mile from the top one encounters some blaze orange fencing that marks the boundary of the ski area. The trail gets a little tougher from here on out as it's primarily steep-ish switchbacks. The forest opens up near the top with long grass very noticeable. At the top, which is sometimes called Radio Ridge, one encounters the top of the ski lift, and numerous tall towers. Some of the towers are used to communicate radio & television signals, and some are evidently used for research. The top of Radio Ridge is open w/ virtually no tree cover. It is frequently quite windy, and the wind whipping around the towers frequently produces a loud noise In fact, the south side of Radio Ridge consists of "black toothpicks" left over from the 2003 Aspen Fire, with rapidly-recovering undergrowth. From this area one can connect w/ numerous other trails. A favorite of mine is to continue west along the top of the ridge towards the parking lot near the true top of Mount Lemmon towards the Meadow/Mount Lemmon Trail. If one does the entire loop it adds about 2 miles to the Aspen Draw hike. As an added perk one can take the ski lift back down to the Ski Valley parking lot if one's knees are sore. One can also connect to the Aspen trail to go down to Marshall Saddle and Marshall Gulch. 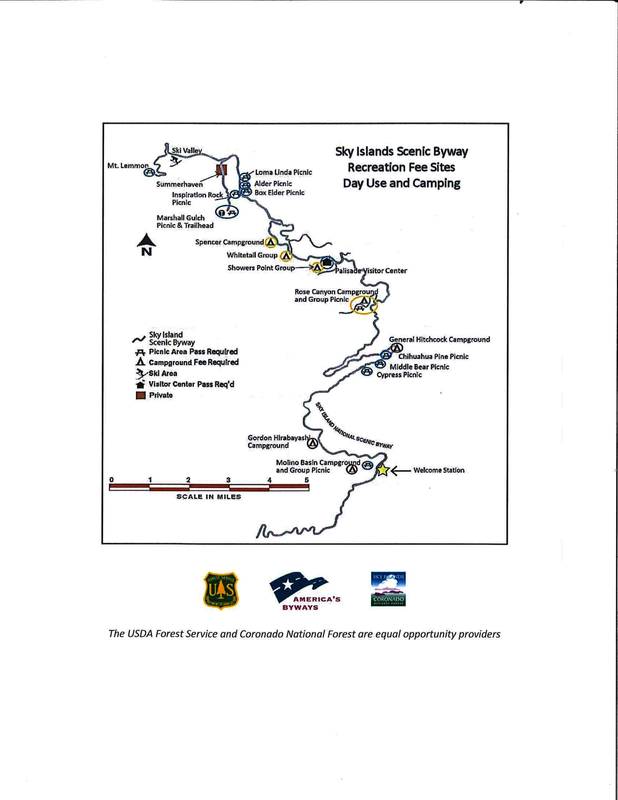 There are a number of other connecting hikes that one may be interested in. *When referring to "Mount Lemmon" I refer to the actual highest portion of the Santa Catalinas rather than the entire Santa Catalinas range as some people do. Geographic Mount Lemmon is west of Summerhaven. *Weather on Mount Lemmon can be quite unpredictable. One can be basking in the sun @ the bottom in the ski area parking lot, and then enveloped in a violent thunderstorm an hour later at the top (especially during monsoon season). Even when it is comparatively warm & sunny, the trail may be quite cool as it is usually in the shade. Wear layers, and plan accordingly. *Many residents of Summerhaven hike this trail, and let their dogs run loose. I recommend carrying a stout hiking staff as some of the unleashed dogs I've encountered have been less-than-friendly. *Many mountain bikers have cut around erosion control barriers, thus increasing erosion. Please use proper hiking etiquette, and do not follow their lead. 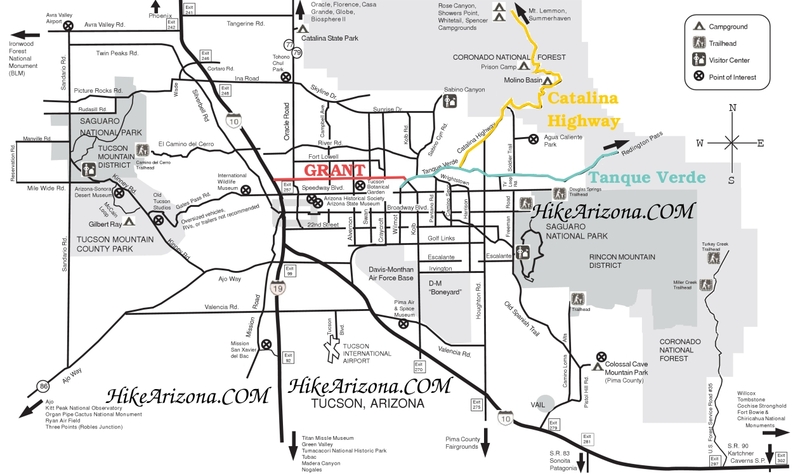 Take Catalina Highway from Tucson to the Mount Lemmon Ski Valley. Park either to the right (ungated) or to the left closer to the ski area facilities (gated, but open until 5 p.m.). Walk along the ski area-side of the highway back the way you came, and duck inside the guardrail as soon as you can, which is about 5-feet from the eastern edge of the ski area-side parking lot. Walk along the trail, which runs just outside of the guardrail on the ski area-side of the road. This section lasts less than 1/10 of a mile, and then dips down into the drainage to the right. The trail goes through a short section of large trees, and then crosses the frequently-running creek just below the lower- and eastern edge of the ski area. There the trail forks: the left fork follows the headwaters of Sabino Creek down to Summerhaven; and the right fork is the Aspen Draw trail. There is a sign at this junction.